I think we all love grilling in the summer. It can super simple or complicated. But it takes us outside, away from the hot oven, and into the less dishes arena. I am a fan of that. Even though for this side dish I do use my grill pan thingy. I love this grill pan thingy. It is great for veggies, fruit, and even fish that is delicate and can fall through the grate. It is my go to veggie grill dish. I also grilled some sliced onions, and salmon that day. I made salmon burgers using the chipotle lime mayo recipe as a spread. 1. Cut up the cauliflower, leaving the florets in larger pieces. Toss the florets with salt, pepper, lime zest, lime juice, and olive oil. 2. Heat up grill. Get the grill HOT! 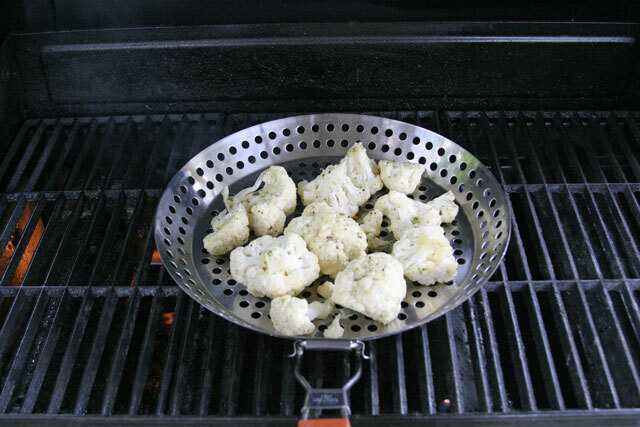 Place the cauliflower in a grill pan, like below, or directly on grate if you don’t have a pan. Grill over medium heat, and turn/toss every couple of minutes. Grill for 7-10 minutes, or until al dente. 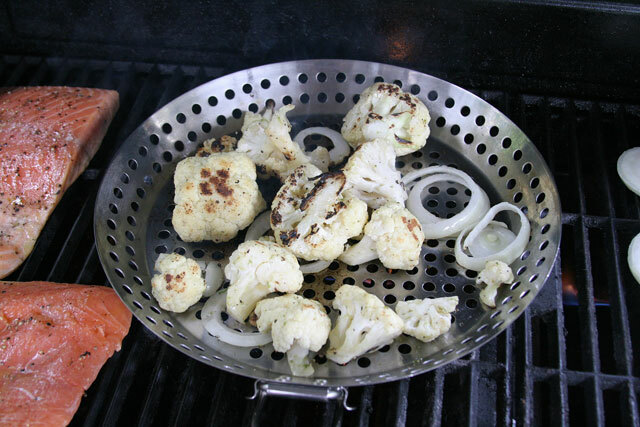 I love roasted cauliflower but have never tried it on the grill – must change that this week! Oooo yeah! You totally should do it, it’s as good as if not better than roasting. Who doesn’t love grilling? Of course I say this having never yet gotten the grill out of the garage this summer… 🙂 Maybe next weekend we can throw on some of this amazing-sounding cauliflower. I love the lime juice!